So this year, I have decided to try and roast our Christmas Turkey (a little early I know but just wanted to get some ideas! ), on my 57cm Weber Master Touch so the other half in doors, can go about sorting out everything else! I’ve never roasted a turkey before so this will be both exciting and nerve racking!!!! Would I be correct in assuming that I can just put the bird on the grill (after it has been stuffed and flavoured!) and use my probes to monitor the cooking temp until it hits the 165 mark (I can obviously use the cooking grate side openings, to add more briquettes if needed, during the cooking process)?! Would I also need to use a drip tray under the bird (filled with liquid?) as well? Yes. And I would do a practice bird ahead of time. Always helps with timing and so you know what to expect / change for the main event. ..nice one - appreciate the help. Cook the bird until the breast meat reaches 157 degrees (recommended final cook temp by ThermoWorks). The temp will continue to climb while resting to 165 degrees. If you cook it until the breast meat reaches 165 degrees, it will climb to 175 degrees while resting. The breast meat will then be dry. 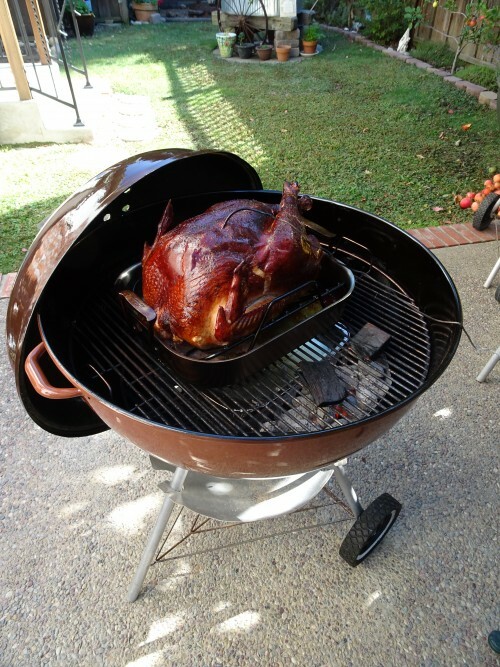 Rest your turkey after taking it off the grill for at least 30-45 minutes prior to carving. I cook a turkey on the Weber every Thanksgiving and several more during the rest of the year. I use to cook them in a roasting pan on the cooking grate indirect. The last few years I have spun them on the Weber using a rotisserie (thanks to urging and prodding by @Travis ). The weather in California around Thanksgiving is usually in the 50's. I start out 25 lit briquettes in each charcoal basket. I add 9 unlit briquettes per side every hour. 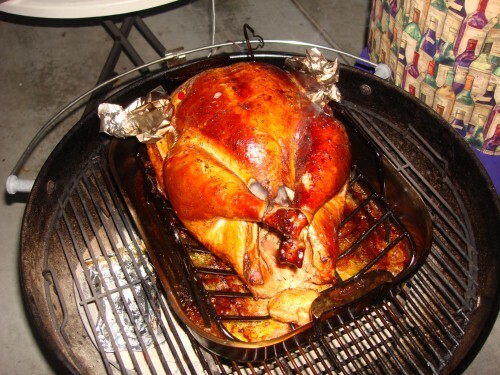 A 14lb bird will usually take about 2 hours on a Weber. Figure about 11 minutes per pound in computing cook time. Make sure your bird is totally thawed and remove it from the refrigerator 2 hours prior to cooking. Also, arrange your charcoal baskets more to one end. I don't stuff the bird when cooking on the Weber. I save the drippings from the roasting pan and separate the fat from the usable drippings. My wife cooks the stuffing in the oven and then I pour the drippings over the stuffing, mixing it in when it's cooked. Stuffing the bird will extend your cook times extensively. That looks like the perfect turkey. Did you make Big Time Gravy? Appreciate that @Cellar2ful - those birds of yours look tasty so will definitely be following your advice. ...do you think it would be necessary to cover the bird in silver foil whilst in the Weber and should I be filling the drip tray with any liquid before the cook? I also noticed that you have your bird cooking in a tray inside the Weber, would this be better than sitting the bird directly on the grill? I plan to do a turduckin on my 26" with a rotisserie. I made an 8" extension ring that I can mount the rotisserie to. I plan to use apple wood. Or do you think I would be better off just doing it in the WSM? Its not necessary to cover the bird with aluminum foil. You can use aluminum foil to cover the wing tips after the first hour to keep them from overcooking and drying out (seen in the middle photo above). If when adding charcoal you see the color of the skin is what you want, you can then loosely cover the top of the bird to stop the skin from getting darker. In regards to placement of the pan, I find it easier to cook the bird directly in the pan, rather than with the pan below and between the charcoal. Much easier putting on and removing the bird from the grill. It also keeps the drippings which I use, much cleaner when the pan is on the cooking grate. When it is between the charcoal, I found that ashes get in the pan when charcoal is added every hour. You can add 1/2 cup of chicken or turkey broth to the pan, along with some cut up celery if you wish. If you add any wood, do it when the bird is first put on and use sparingly. Wood smoke quickly darkens turkey skin (see the bottom photo in my post). It's all a personal preference as to the color of the skin you want. I have not tried it but have read you can also cover the top or breast of the bird with cheesecloth to keep the skin from getting to dark. I’m actually going to be cooking a turkey crown (which is literally just the breast meat). Would the procedure to cook it (as per your initial reply) still be the same? Here was my first go at roasting a turkey on a kettle. I now use a rotisserie, but this method worked great for me. ...just following on from this thread (save starting a new one) - is it better to have the wires from a wireless thermometer (I have the dual probe ThermoPro TP20), coming out the top vent? I normally just have these coming out the side of my Weber Master Touch but always fear that the lid crimping the wire against the bowl, may actually damage the wire itself?! I don't stuff the bird on the Weber. I do that in a separate CI Dutch Oven on another Weber. As stated above, by the time your stuffing is at temp, the breast is over cooked and will most certainly be dry. I jam the bird cavity with sliced granny smith apples and quartered oranges and a small pealed onion and truss it up with butchers twine. Cook indirect at 325-350f with baskets one on each side and a drip pan below. Last bird I did was with Pecan smoke wood. I also inject my bird with Cajun butter and put pats of butter strategically placed under the skin on the breast. I check it for color at the 2 hour mark. when desired color is achieved, I tent it with foil until the It hits 155 or so pull it, let it rest and let it carry over to 165F. First ting I do is yank out the "Pop Up" timer thing... when those pop, chances are your bird is over cooked. I use my Maverick 732 along with my Tip Top Temp. Total cook time for a 14 pounder was about 3 hrs 30 Minutes. Always moist and never any left-overs.... No sammiches for me!!! Rats! Well, my first attempt at roasting the turkey went pretty good! Also used some cherry wood to get some nice colour. 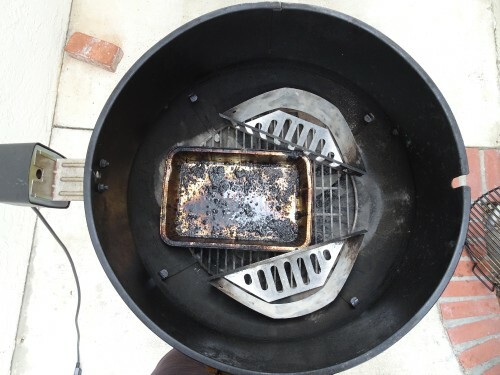 I kept topping the charcoal up, once an hour, to maintain the heat and basically kept it inside the Weber until my temperature probe reached 157F at which point I took it out and let it rest a while until the temp reached about 165F. Thanks to all the great advice in this thread - will definitely be having another go at this. ...apologies - the pics above seem to have super sized!?!? I have to scroll left and right to view them?!? !